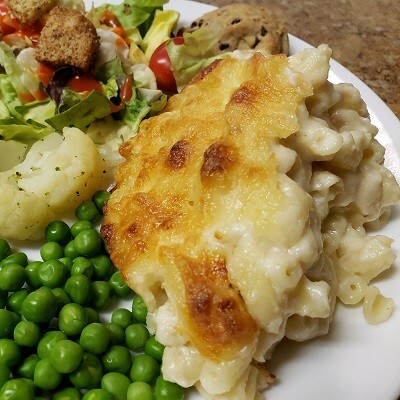 For baked macaroni and cheese, heat the oven to 375 degrees Fahrenheit and butter a 3-quart casserole dish or spray with non-stick cooking spray. For stove-top mac and cheese, move on to the next step. Bring a large pot of salted water to the boil, add the pasta then follow package directions, but cook 1 minute less than the recommended cook time. Drain then rinse pasta with cold water. Add milk to a large microwave-safe measuring jug and microwave 1 to 3 minutes until warm. Alternatively, you can add milk to a large saucepan over medium heat then heat milk until warm. Melt the butter in a large, high-sided pan over medium heat. When the butter begins to bubble, add the flour. Cook, constantly whisking until the butter smells fragrant and nutty — the color of the butter-flour mixture will be light brown; 2 to 3 minutes. While whisking, slowly pour the warm milk into butter and flour mixture. Continue to cook, constantly whisking until the sauce bubbles and thickens. Remove pan from the heat. Stir in mustard, black pepper, cayenne, nutmeg, 4 cups of cheddar and all of the Romano cheese. Stir until the heat from the sauce melts the cheese. Taste for seasoning, and then adjust with additional spices or salt (we usually start with 1/2 teaspoon of fine salt and go from there). If the drained and rinsed pasta will fit into the pan, add it to the cheese sauce. If the pasta will not fit, add both the pasta and sauce to a separate large bowl and stir well. Serve as stovetop macaroni and cheese or continue to the next step for the baked version. Pour into the prepared baking dish. Top with about 1/2 cup of extra cheddar cheese. Bake, uncovered, until bubbling, about 30 minutes. Turn oven to broil then broil 3 to 5 minutes until the top has blistered and lightly browned. Let stand about 10 minutes before serving. Arrange one rack in the middle of the oven and one rack in the highest position, then heat to 450°F. Place a rimmed baking sheet in the oven while it's heating. Combine the broccoli, olive oil, salt, and a few grinds of pepper in a large bowl and toss to coat. Carefully remove the hot baking sheet from the oven, add the broccoli, and spread it into an even layer. Roast on the middle rack until the broccoli is tender and beginning to brown at the edges, 15 to 18 minutes. Remove from the oven. Switch the oven to broil. Scatter the Parmesan evenly over the broccoli. Return to the oven and broil on the upper rack until the cheese melts, 1 to 2 minutes. Squeeze the juice from one lemon half over the broccoli and toss to combine. Cut the other lemon half into wedges and serve alongside the broccoli. Thursday, April 11 2019 CPT: Just a Dip? No...Make it a Meal! Thursday, April 04 2019 CPT: Gimme Cheese Please! Thursday, March 14 2019 CPT: Top O’ the Afternoon To Ya!